$4/2 Any Starbucks Coffee Products = FREE Singles! Update: I was able to print this using google crome as firefox and safari did not work, I also had to update my java. Where it says “print coupon” try right clicking to open a new window and then try to print from that - that seems to be what worked for me. 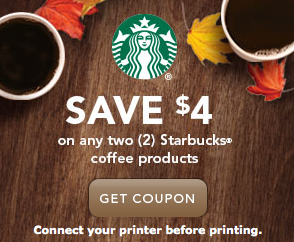 $4/2 any Starbucks Coffee Products Print - Click upper right, "Special savings". Expires 10/15/2014. Coupon may take a minute to load. Print limit is 2! This = FREE Starbucks singles at PC & most other stores!